One of the things Don jokes about is how he does home improvement projects to the point of functionality, and no further. What he means is, he makes something juuuuust to the point where it can be used, but never gets around to finishing it to the point where it's beautiful. Fortunately I have a high tolerance for such things, so it doesn't bother me. So whenever we DO finish a project, we're inordinately pleased with the final results. Makes for a high "joy" concentrate. 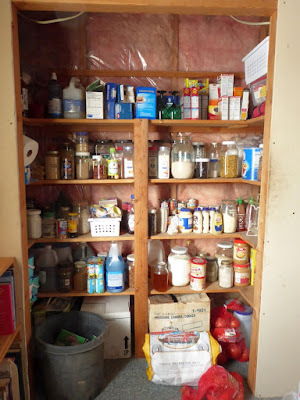 A couple weeks ago, I looked at the pantry and brought up a subject we'd discussed a few times before: "Can you make doors to close the pantry?" It seems like a simple thing to do, but in reality it wasn't. Folding doors, hinged doors ... almost any configuration was either awkward or complex or simply wouldn't work for the corner where the pantry is tucked. So Don came up with a brilliant idea: "What about curtains?" Perfect! We could choose a heavy fabric in a complementary color, and curtains would be a snap. Don said he would make a barnwood frame around the front of the pantry to hide the gap at the top. However the price per yard was heart-stopping. Discouraged, I searched the internet for less expensive alternatives, but found no fabrics that appealed as much as the one in the fabric store. However when I looked at the fabric store's own website, there was the identical fabric -- for almost half-price. With free shipping. Go figure. So I ordered the yardage needed to make curtains for the pantry. 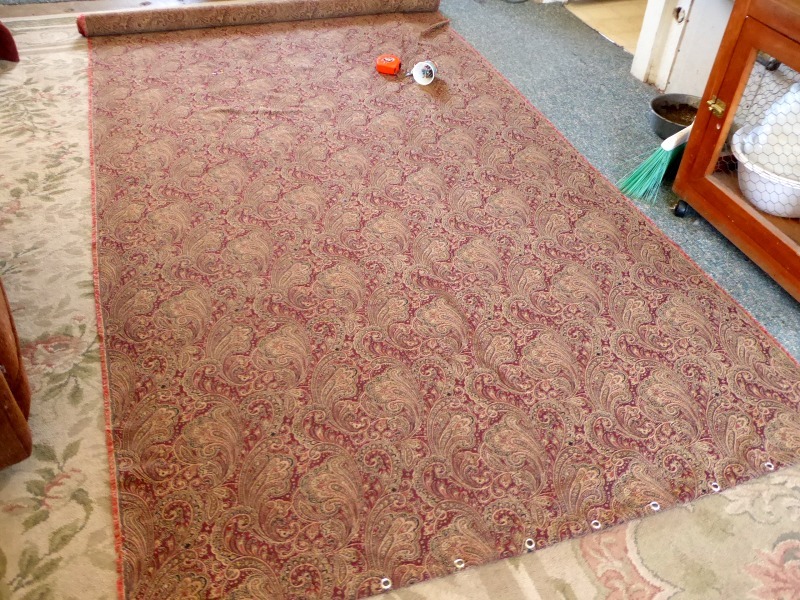 It was a simple matter to measure out the proper lengths, and put grommets at one end of each length. The result is a rich, luxurious-looking heavy curtain that covers the clutter of the pantry contents and makes the living room look far more finished and tidy. 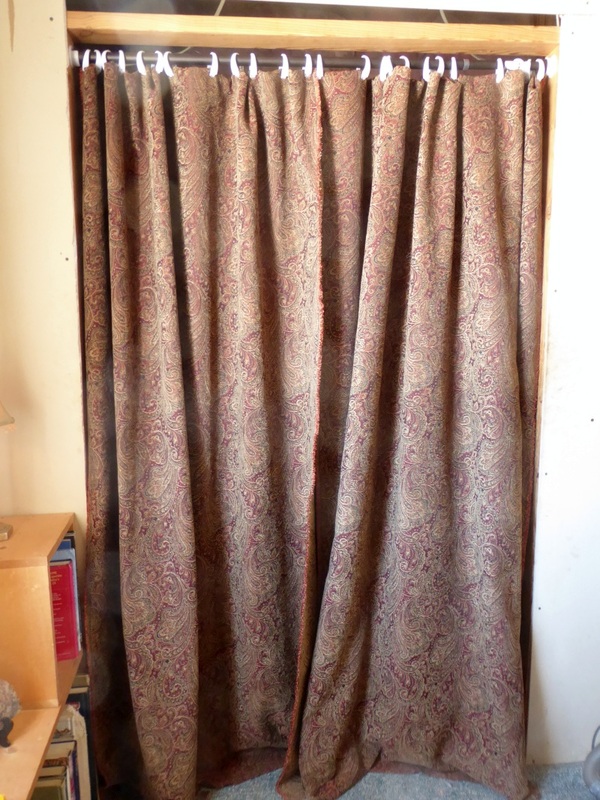 I wanted to get the curtains hung before our neighborhood potluck (Friday evening) so I didn't have time to hem them. That will be this weekend's task. But meanwhile, it's the first home-improvement project I've done in a long time, and I'm absurdly -- disproportionately -- tickled with it. I keep interrupting random tasks to stand in front of the curtains and admire them. It's the little things in life! Would you mind sharing the name of the fabric store? 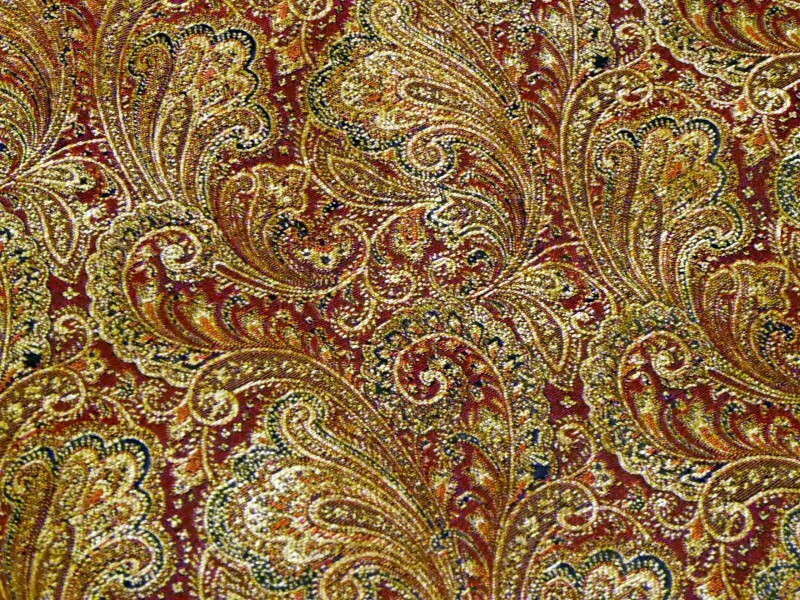 I always love a good bargain fabric. First rule of thumb for buying fabric from Jo-Anns: Never go shopping there without down loading coupons first. I think all their prices are double, and most customers show up with half price coupons. An additional plus is that your pantry is now in heated. Very needs ce. A great solution and an attractive one as well. Looks great! I had to laugh because I will find myself doing the same thing...stopping to admire and enjoy my drawers or closet that finally were made nice and neat. Very attractive. I love the fabric. 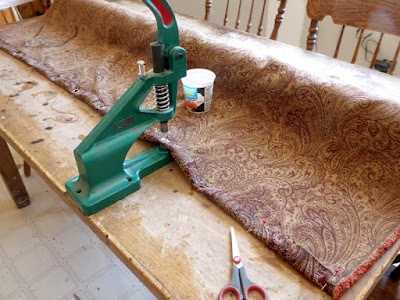 It is similar to one I used once for a window valance and to recover seats in dining room chairs. It's a classic pattern that you will enjoy for a long time to come. We've lost the habit of using curtains as they once were. 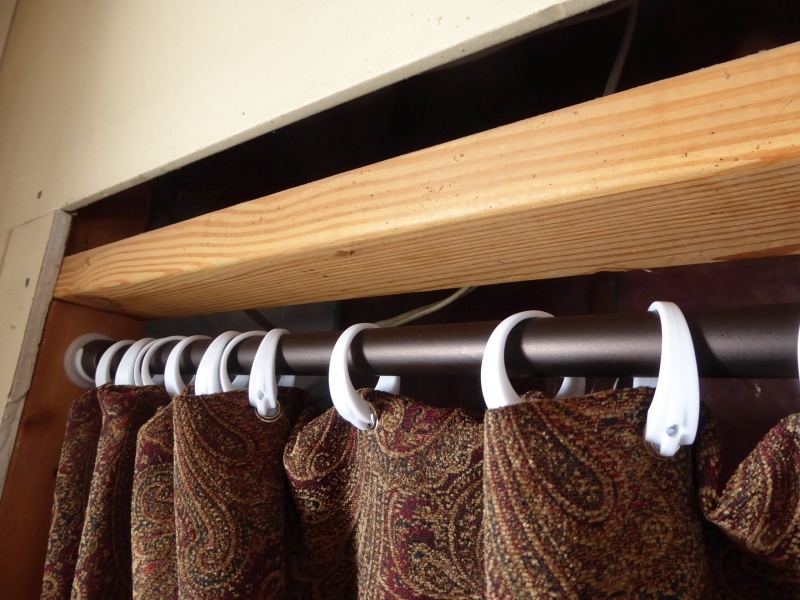 True, they provide privacy, but initially, curtains were part of the heating and cooling. 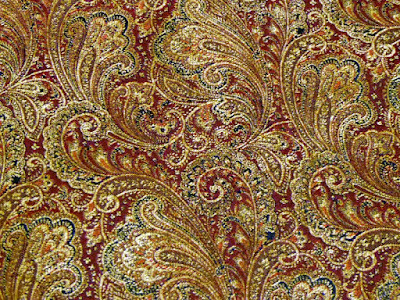 Tapestries are beautiful, but their function was to separate cold rock walls from the heated room. Hung so to avoid condensation on the cold wall. I first realized the use of curtains as more than window coverings or makeshift doors when I saw in the original 'Miracle on 34th Street' the curtains that were hung as to facilitate the closing off of the entryway shown when Maureen Ohara comes over to collect Natalie Wood at the lawyer's apartment meeting him for the first time. Obviously, the curtains were a nice accommodation in a poorly(by today's standards) heated 1940s apartment. 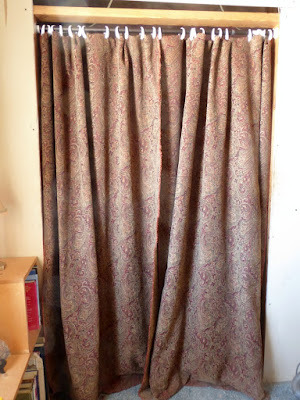 Using curtains to hide an alcove is also a good idea to revive. I have recently moved into and OLD farmhouse, as in no central heat or a/c. I bought a thermal panel and placed in the hallway, effectively closing off half the house! Very helpful in keeping the living space warm. I do have 2 fireplaces, but the one in the living space, does not heat anything down the hallway, and I'm not going to start and tend a fire that I"m not sitting in front of! It will be wonderful for guests though. Oh, and I used very nice THERMAL curtains for the living room. and will use them througout the house. AND I have 3 very small bedrooms in this funny old house. The one closest to the kitchen is now a pantry. Fun topic and helpful! I recall you had installed shelf protectors a while back to help prevent breakage in the event of an earthquake I do not see them up - are you still using them? The earthquake protective lattices are used in the canning closet, where we store our home-canned food in glass jars. I don't have any protection in our pantry, which has a lot of stuff that wouldn't break if an earthquake hit. 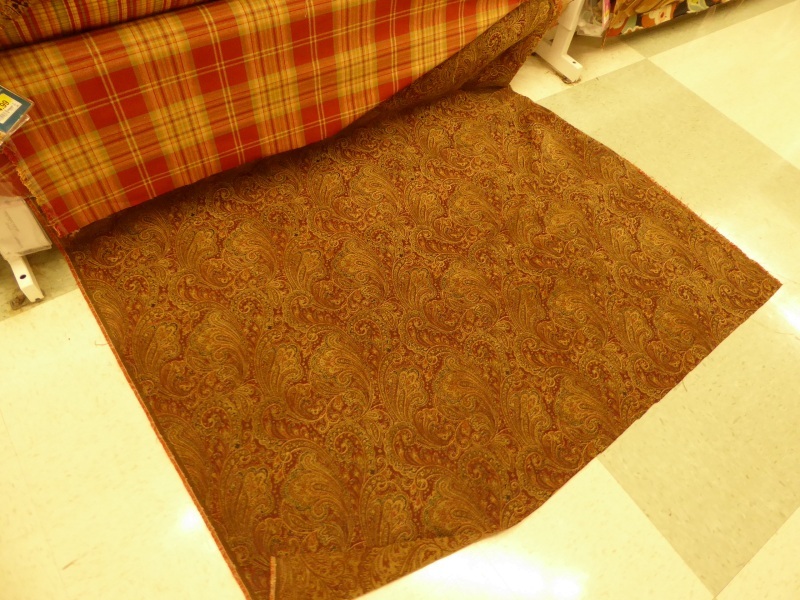 Furniture stores dispose of upholstery fabric samples once or twice a year when new designs are released. Often they just stack them in the warehouse. Samples can be as large as 2 feet square, and are generally hemmed. I get them free just for asking. I've made many curtains and furniture covers just by piecing together coordinating samples, they're all the same size so simple enough to to. Get lots of compliments on them! There are all sorts of uses for large pieces of heavy duty fabric...I keep a box full on hand at all times! May be worth looking into for future projects. Good job Patrice. If I may offer a suggestion though; the curtains touching the ground will collect everything under the sun, especially Lydia's hair, so if that kind of thing bothers you then make sure when you hem the curtains you make them short enough. When we moved into our new home we pulled out the dishwasher (I think dishwashers are a waste and disgusting) and put up a tension rod and curtain to hide the space. As messy as a kitchen gets, even a little drag on the floor curtains cause a lot of mess. Remedy was simply to hem the curtains. Lovely, and of course you are going to stop to admire your accomplishment! Since this faces your living room, is there any extra fabric to make coordinating pillows for the couch? Love the fabric. Joann fabrics almost always have 40 percent off coupons available too, just google and print. You know, Don makes amazing mugs. For some reason when I look at your walls I imagine wood paneling, even cabinet doors, that look just like his mugs. It would be cool to have a home full of the same artistry as his mugs. Decorating is fun!